As May approaches, many are left scrambling to find a good gift for Mother’s Day. Luckily for me, my native country of Peru celebrates Mother’s Day on the second Sunday of the month, just like in the United States. Many people focus on finding the perfect gift, and that creates more stress than happiness. The most important thing this Mother’s Day is to keep things relatively simple. A majority of Moms want to spend time with their children this Mother’s Day, so give that time to them. It is important to set the hectic schedule and distractions aside to focus all your attention on Mom. Even though my mother is far away, I will call her on Mother’s Day, and we will celebrate when I visit her in June. Taking your mother out to dinner on Mother’s Day is a great option for you and the whole family to be together for her on that day. The outing does not have to be expensive, and I assure you, your mother will enjoy her special day! The idea is to find your mother a beautiful gift, because we all believe that our moms deserve the best! On average, the majority of people will spend no more than $100, so keep that in mind when picking a budget. The team at Evelyn Brooks Designs is thinking about you and all mothers leading up to May 12. We offer jewelry pieces not found with other jewelers, and at a price most can afford. 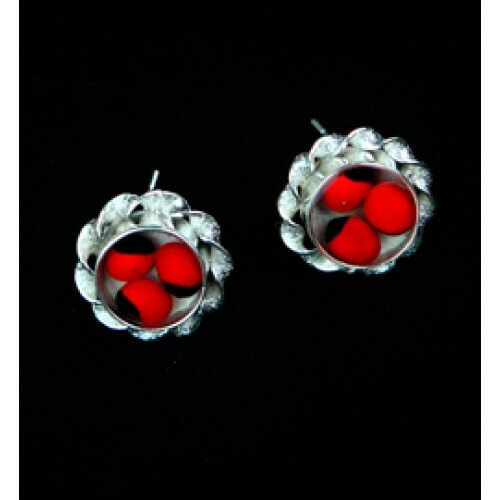 The earrings shown above are called “Exotic Trilogy Series with Epoxy” and are priced at $95. The red and black design comes from the Amazonian Huayruro seeds that are extracted with sustainable methods. The gift would be a nice surprise to your Mom, as she would see her children thinking not only of her, but of the environment as well. If your mother already has enough earrings, a bracelet could serve as a better option. 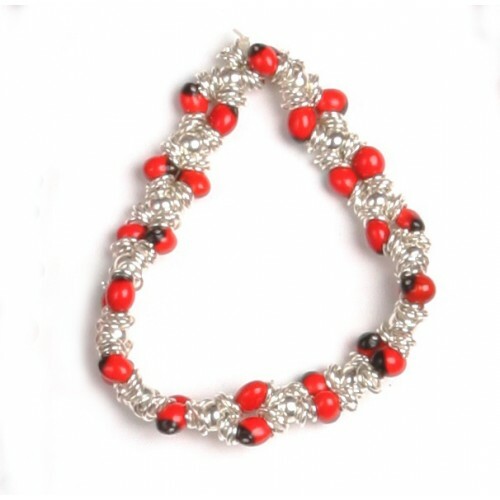 The stretchy bracelet by Evelyn Brooks Designs fits from (6.5″ to 7.5″). The red and black seeds in combination with the silver came out beautifully at the end. Priced at $69, this option could leave more in your wallet, so you can also take your mother out for dinner. Evelyn Brooks Designs is holding a special offer for anyone who spends $100 online by giving a free good luck charm with your purchase. The offer does not end there! Using the code EMAIL20 will give you an additional $20 off of your purchase. At Evelyn Brooks Designs, we offer unique designs at affordable prices, all while using sustainable resources. I hope that my ideas were helpful for this Mother’s Day, and that no matter what, you enjoy this day celebrating your mother! Also, please don’t forget to like us Facebook on or follow us on Twitter and Pinterest to find more Mother’s Day ideas from Evelyn Brooks Designs! Pingback: Great Mother’s Day Gifts from Evelyn Brooks Designs!